Containing arches in all levels of development and trails leading to various hidden formations, hiking in Devil's Garden is a fantastic adventure for the entire family. Private Arch was discovered in 1970 by some students and their professor. Double O Arch is 2 miles from the trailhead. The Primitive Trail begins at Double O Arch and rejoins the main trail at Landscape Arch. Devil's Garden Trail is 7.2 miles long and takes 3-5 hours. Landscape Arch spans 300 feet. Pay attention to the cairns as the trail can be unmarked in places. 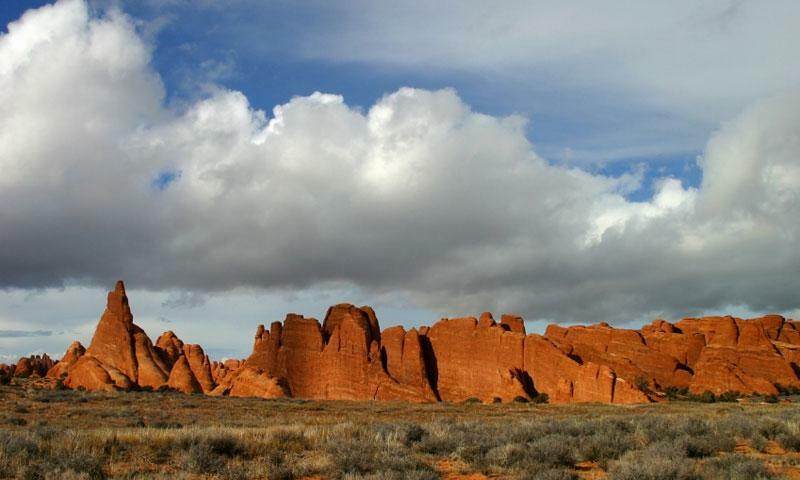 The Devil's Garden Trailhead is 19 miles into the park and is 7.2 miles long. This area displays eight arches in various stages of development and provides access to one of the longest arches in the world, Landscape Arch. Longer than a football field, Landscape Arch rivals Kolob Arch for the title of Largest Natural Sandstone Arch in the World. Only 11 feet thick and 300 feet long, the arch is nearing the end of its geological life span. One hundred and fifty feet of rock has fallen from the arch since 1991, and the trail directly beneath the formation has been closed as a safety precaution. The Devil's Garden Trailhead is 19 miles from the park entrance. Delicate Arch is 1 mile from the trailhead. The trail is easy, but may be slippery in wet or snowy conditions. There is no overflow parking and only 150 spaces in the parking lot. Arrive before 9 am if you want to get a space. Just a step down from Landscape, Double O is the second largest arch in Devil's Garden. Part of a single Navajo Sandstone fin, these two arches are stacked, one with a 71 foot span atop another with a 21 foot span. Considered easy to moderate, the trail gets rough after Landscape Arch. Rock climbing is prohibited on any named formation in the park. The spur leading to Private Arch is .04 miles up the Primitive Loop Trail. 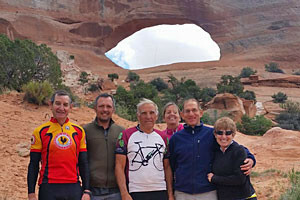 While hiking through Fin Canyon, Professor Noel De Nevers and a group of his students discovered the arch in the late 1970's. Upon displaying the pictures and location of the arch, they were shocked to discover that the formation had not yet been documented. Beginning near the Double O Arch, the Primitive Trail is 2 miles long. Private Arch is located .04 miles from the Primitive Loop Trailhead and is on a spur .02 miles in length. The Primitive Loop is considered a bit more strenuous, especially during bad weather. A cartographer accidentally switched the names of Delicate Arch and Landscape Arch. The mix up is evident when you see the formations in person. 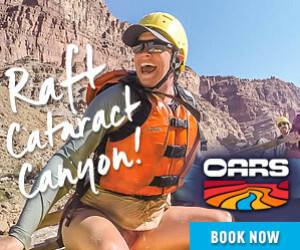 Connect with travelers planning a visit to Moab Utah.